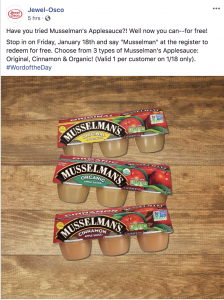 Get your choice of Original, Cinnamon & Organic applesauce tomorrow, January 18th at Jewel when you tell your cashier Musselman’s – no tax, no loyalty account, nothing but free. I never go to the Jewel website. Thanks for posting these.